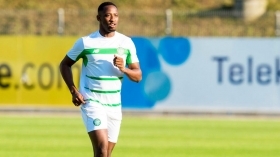 Premier League giants Manchester United and Arsenal will reportedly fight it out for the services of Celtic striker Moussa Dembele in January. The France Under-21 international has been a huge success at Parkhead since his summer switch from Fulham. According to ESPN. both the Red Devils and the Gunners are monitoring the progress of the young marksman, and it could come to a bidding battle to decide who gets hold of his services. The 20-year-old, who has bagged 16 goals in 26 outings this season, has shrugged off speculation over his future, but this could all change before the start of the winter transfer window. Celtic currently have a £40m price tag placed on the player they recruited for just £500k from Craven Cottage in the summer.